Enrollment for joining the Associate Lodge, (the civilian affiliate of the Fraternal Order of Police), is always open to the public. Do you believe in a better state, community and country? In professional law enforcement? In protection for your family, home and business? In a united effort to safeguard freedom? Then becoming a member of the FOPA may be for you. The Grand Lodge of the FOPA was formed on August 27, 1967. On August 12, 1971, at the 40th National Biennial Conference of the FOP, the Constitution and By-Laws of the FOPA were approved by the delegation present. Since the the membership has grown to over 100,000 strong Nationwide. 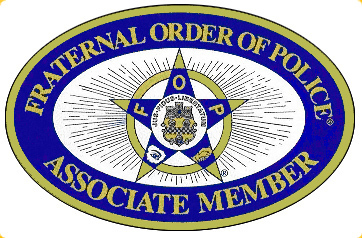 The FOPA is a civilian affiliate of the Fraternal Order of Police. The FOPA is a non-partisan organization, without regard to race, creed, color or religious beliefs. Membership is open to anyone 21 or over with no criminal convictions. The FOPA's interests revolve around Law Enforcement and the men and women that have dedicated their lives to the protection of ours. Our members are friends and families of Law Enforcement Officers, responsible and respected business persons, professional men and women from all walks of life - people willing to donate a portion of their time and efforts towards assisting the parent lodge. Give the Lodge a call, send us an EMAIL or just come to our next meeting and introduce yourself. hats, and other great items. Road Champs limited edition collectible die cast cruiser. Other Swag: Mugs, mouse pads, pins and more.